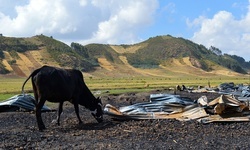 Two years ago, on the edge of Chitu in Ethiopia’s unsettled Oromia region, local officials told Chamara Mamoye his farmland might be developed when the small town expanded. He hasn’t heard anything since. “Losing the land would be a big problem for me, but if the government forces us, we can’t do anything,” the father-of-five says outside his compound.